The services provided by a National Wildlife Removal company are live animal removals, trapping, dead animal removals, wild animal evictions using various methods, and deterrent methods to help prevent wild animals from wanting to become a nuisance. Often when a nuisance wildlife removal service is called out they can catch the animal and take it away on the initial service call. In this case a mother raccoon climbed into a chimney and gave birth to three raccoon pups. 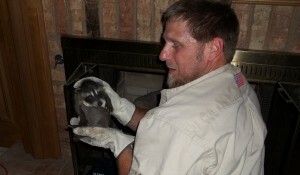 In this case the tech decided to get rid of the raccoon mother from the chimney and take out the raccoon pups by hand. He then placed the raccoon pups in a box in the back yard and the mother came back at dusk to relocate them off the property. Another scenario for this situation would be to place a raccoon trap on the top and have the mother raccoon go into the trap. After the mother is secured take the raccoon pups out and relocate them together to a state designated location. Every state has its own laws to abide by and every National Wildlife Removal service listed here will proceed under the wildlife removal procedures for that state. Wild animals often are not so easy to locate, but the evidence of a wild animals presence is clearly visible, trapping is the preferred method for a quick animal removal. 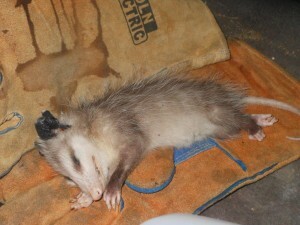 If an opossum is in an attic in the far corner under the insulation, trapping is the best method for removal. 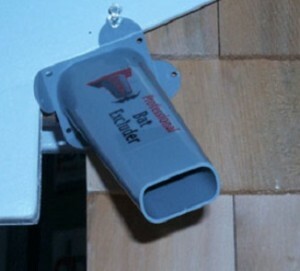 Traps set in the attic or outside near the entry point will usually get the animal quickly. Our trained professional nuisance wildlife companies listed here on NWR have the experience to identify and trap the correct animal in your attic or where ever you need an animal removal. If you have armadillos in your yard digging, a trap is the only fast successful removal method. The thing about armadillos is no bait is used to trap them. Knowing where to place the traps is the trick. You see, armadillos eat grub worms in the soil, so putting pet food in a trap will only attract pets or other wild nuisance animals. Squirrels, raccoons, armadillos, beavers, groundhogs, opossums, and skunks are the most common animals in North America to be trapped and relocated. Many times a wild animal has gotten into a space and cannot get out. Unfortunately the animal dies and starts to decay. This unpleasant situation happens often to homeowners without their knowledge of an animal presence even on their property. Murphy’s Law comes into play here, the carcass is hardly ever easy to find and unless in plain sight cannot be located until enough decay has happened. New soft wet spots in walls and ceilings are a good clue that there is a dead animal carcass decaying in that spot. Bats are not an animal that should be trapped or live caught to be relocated. To have bats removed from a structure you must find the main entry/exit point and put up bat cones or bat netting. This will allow the bats to exit but not allow them to re-enter the structure. Important note for bat exclusions is if the structure is not completely sealed before the cones or netting is up the bats will just move in a new spot on that same structure. 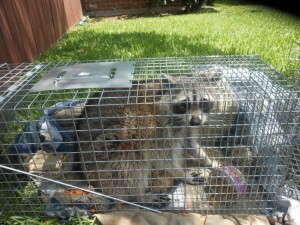 Raccoons methods of removal can vary depending on where the raccoons are in the attic or walls. Scent products made for raccoons work extremely well on mother raccoons. The mother raccoon is a good maturnal animal. She raises her young until she cannot nurse anymore. Raccoons find other raccoons using pheromones to track mates for breeding. Often male raccoons will find a mother raccoon with litter. This is not good for the mother raccoon and her litter. Unfortunately the male will kill her young and re-impregnate the mother. Nuisance wildlife control officers have used this to your advantage by developing scent control products. These products use the male raccoon scents to scare the mother raccoon out of the attic or structure she has nested. The mother will relocate the litter usually that evening off your property. I like this method because no animal handling is needed, the mother raccoon does her own relocation. The best deterrent methods are all common sense. Do not put cat or dog food outside for pets. Raccoons and opossums will find it and will take up residence on your property. I hear all the time from my clients that neighbor is feeding their cats outside and don’t care about the raccoons eating the food. It is unfortunate that those same raccoons hang around and get into other peoples attics. Keep up on deteriorating materials on your home. Replace rotting siding and sofit boards. Put a full coverage chimney cap on the chimney to keep out larger animals and birds. Do not put trash cans out overnight, wait until the last possible time you can put them out reducing animal interest. Coming home one evening a homeowner saw a raccoon running from his bushes to enter a storm drain. Not thinking anything about it except, look a raccoon. Three weeks later at 3:30 am loud noise was heard from the attic. In the morning the homeowner call out a nuisance wildlife service. During the exterior inspection of the home there was a large damaged enterance hole in the sofit board. Once entering the attic the wildlife control officer confirmed his suspicion, raccoons. Not just one raccoon, but four raccoons. The attic had three weeks of feces and urine all over the attic and when looking at the ceilings noticed many urine stains soaking through. The animal removal and the entry repair alone if called three weeks ago would have run between $250 – $500 depending on what part of the country you live in. Now with the added repairs to the ceiling and insulation that needs to be taken out and new insulation put back in the cost has exceeded $5000.